Airbrush makeup is oil water based or silicone based. 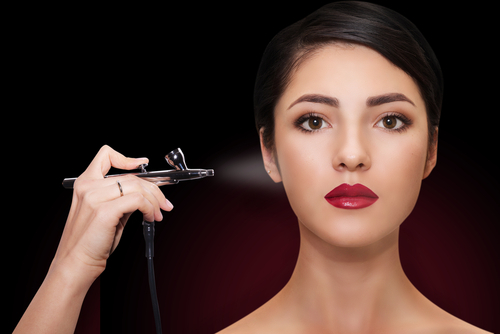 It is applied using a small makeup gun connected to an air compressor, converting makeup to a fine mist and creating the most flawless looking skin possible. Because of the nature of airbrush makeup, it is also said to be healthier for your skin, allowing it to breathe. The results are a natural, finished look. Consult: You’ll always start any service in the salon with a full consultation. This is a time when you and your client can share ideas through photos and discuss the overall appearance that you’ll be creating for them. You can make suggestions that pair well with your clients face shape to create the most balanced, flattering look. For instance, for any look, you’ll want to talk about featuring the eyes or lips, choosing one to keep the look natural. Choose Makeup: Keep in mind, airbrush makeup seems extremely expensive, however, you want to aim for quality because the better quality the makeup, the less likely it is to clog your gun. Choose Gun: When choosing a gun, you’ll either go with single action or double action. Single action guns give you less control but are easier to use than double action and are less expensive. Double action guns require two actions at once, with finer trigger control, but are much more difficult to master. That being said, it is best to start out with a single action. Set your compressor on low or medium and then turn it on, holding your gun like you would a pen. Start with a colorless makeup primer to even out skin tone, giving the foundation an even base. You will apply airbrush makeup in the same order as ordinary make up: Prime, Conceal, Cover, Highlight, Blush and Bronzer. Shake foundation to mix well. Use 6 - 10 drops of makeup and test on your hand. Begin the makeup application. Pull back on trigger for makeup control. Always apply airbrush makeup in small circular motions, keeping your hand moving. Apply makeup 4’ - 6’ from the face. Be sure and step back periodically, to stop and review your work. Make sure the shade you’ve chosen is an exact match to your clients skin tone. To switch colors, push release button and pull makeup pod out horizontally. Replace cap and repeat steps with the next makeup color. Once your airbrush application is complete you can apply eyeliner or shadow with the airbrush or go in with makeup to complete the eyes with eyeliner and mascara. Last, you want to be sure and clean your airbrush gun after each use. Cleaning varies from brand to brand so always follow the manufacturer's directions to avoid breaking your gun and voiding its warranty.